McNeel Europe has been invited to make a Rhino/Grasshopper presentation at the 5th GiD Conference that will take place on the 26-27 May in Barcelona (Spain). The objective of this fifth edition of the GiD Conference is to bring together users and developers of the GiD pre/post processing system in order to exchange ideas and experience on the generation of data for computer simulation and the graphic visualisation of numerical results. GiD has been designed as a universal, adaptive and user-friendly graphical user interface for geometrical modeling, data input and visualisation of results for all types of numerical simulation programs. Typical problems that can be successfully tackled with GiD include most situations in solid and structural mechanics, fluid dynamics, electromagnetics, heat transfer, geomechanics, etc. 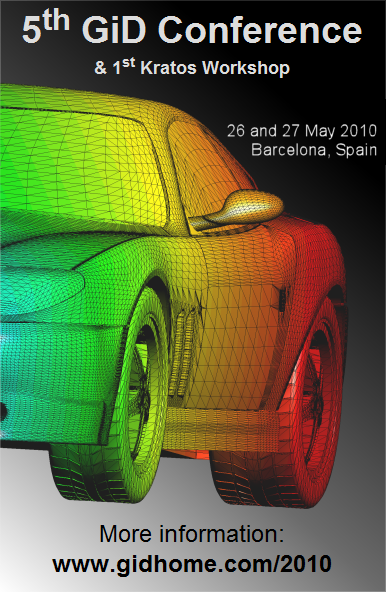 using finite element, finite volume, boundary element, finite difference or point based (meshless) numerical procedures. GiD reads native Rhino format.